Made: The biggest thing that I did last week was finish the dress for my baby girl - it was a new pattern, knitted from the top down with a new yarn and finished, blocked & modelled worn to her Uncle's 50th birthday celebration! The photo above truly shows how cheeky she really is, as soon as I sat her down to take the photo, she pulled her dress straight up & flashed me her nappy, farted & chuckled. Charming!! 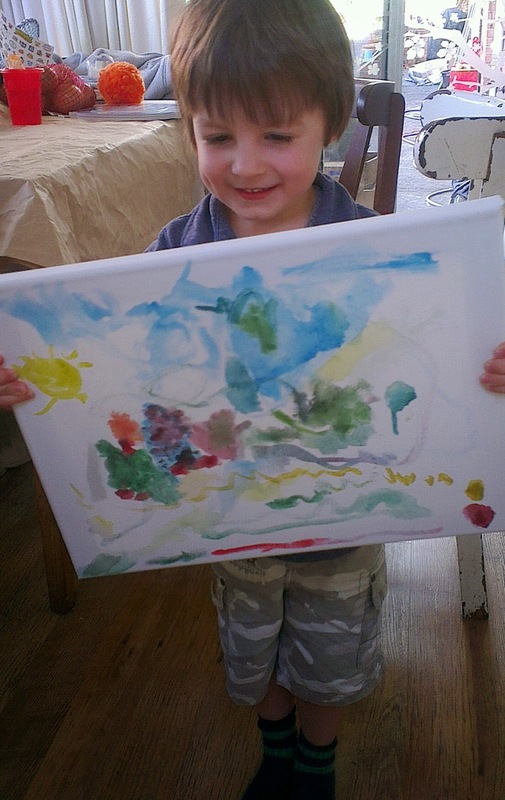 This is bubba Joe with the painting he made for Uncle Nick! Seen: It was great to catch up with my big bro & help him celebrate half a century! Baked & eaten: Have you jumped on the Cauliflower craze? I made this cauliflower pizza base - it tasted awesome! It was possibly one of the best pizza bases I've eaten! ...try it! ..just remember to squeeze all the water out of the cauliflower! !